The 1919 Schenck case marked the first time the Court heard a First Amendment challenge to a federal law on free speech grounds. 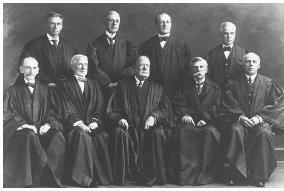 The Court was comprised of the following justices: (standing, l-r) Brandeis, Pitney, McReynolds, Clarke, (seated, l-r) Day, McKenna, White, Holmes, Van Devanter. Schenck v. United States, 249 U.S. 47, 39 S. Ct. 247, 63 L. Ed. 470 (1919), is a seminal case in Constitutional Law, representing the first time that the U.S. Supreme Court heard a First Amendment challenge to a federal law on free speech grounds. In upholding the constitutionality of the Espionage Act of 1917 (40 Stat. 217), the Supreme Court articulated the Clear and Present Danger doctrine, a test that still influences the manner in which state and federal courts decide free speech issues. This doctrine pioneered new territory by drawing a line that separates protected speech, such as the public criticism of government and its policies, from unprotected speech, such as the advocacy of illegal action. On December 20, 1917, Charles Schenck was convicted in federal district court for violating the Espionage Act, which prohibited individuals from obstructing military recruiting, hindering enlistment, or promoting insubordination among the armed forces of the United States. Schenck, who was the general secretary of the Socialist party in the United States, had been indicted for mailing antidraft leaflets to more than fifteen thousand men in Philadelphia. The leaflets equated the draft with Slavery, characterized conscripts as criminals, and urged opposition to American involvement in World War I.
Schenck appealed his conviction to the Supreme Court, which agreed to hear the case. Attorneys for Schenck challenged the constitutionality of the Espionage Act on First Amendment grounds. Freedom of Speech, Schenck's attorneys argued, guarantees the liberty of all Americans to voice their opinions about even the most sensitive political issues, as long as their speech does not incite immediate illegal action. Attorneys for the federal government argued that freedom of speech does not include the freedom to undermine the Selective Service System by casting aspersions upon the draft. In a 9–0 decision, the Supreme Court affirmed Schenck's conviction. Justice oliver wendell holmes jr. delivered the opinion. Holmes observed that the constitutionality of all speech depends on the circumstances in which it is spoken. No reasonable interpretation of the First Amendment, Holmes said, protects utterances that have the effect of force. For example, Holmes opined that the Freedom of Speech Clause would not protect a man who falsely shouts fire in a crowded theater. "The question in every case," Holmes wrote, "is whether the words are used in such circumstances and are of such a nature as to create a clear and present danger that they will bring about the substantive evils that Congress has a right to prevent." Holmes conceded that during peacetime Schenck's vituperative leaflets might have received constitutional protection. However, Holmes said, during times of war no American has the right to speak or publish with the intent of obstructing the Conscription process when such speech has a tendency to incite others to this unlawful purpose. The Supreme Court's decision in Schenck established two fundamental principles of constitutional law. First, Schenck established that the First Amendment is not absolute. Under certain circumstances, the rights protected by the Freedom of Speech Clause must give way to important countervailing interests. Preserving the integrity of the military draft during wartime and protecting theater patrons from the perils of pandemonium are two examples of countervailing interests that will override First Amendment rights. Second, Schenck established the standard by which subversive and seditious political speech would be measured under the First Amendment for the next fifty years. Before the government may punish someone who has published scurrilous political material, the Court in Schenck said, it must demonstrate that the material was published with the intent or tendency to precipitate illegal activity and that it created a clear and present danger that such activity would result. Schenck did not settle every aspect of free speech Jurisprudence. It left unresolved a number of crucial questions and created ambiguities that could only be clarified through the judicial decision-making process. It was unclear after Schenck, for example, how immediate or probable a particular danger must be before it becomes clear and present. If Schenck permitted the government to regulate speech that has an unlawful tendency, some observers feared, Congress could ban speech that carried with it any harmful tendency without regard to the intent of the speaker or the likely effect of the speech on the audience. In 1969 the Supreme Court articulated the modern clear-and-present-danger doctrine in Brandenburg v. Ohio, 395 U.S. 444, 89 S. Ct. 1827, 23 L. Ed. 2d 430, stating that the government may not forbid or punish subversive speech except where it advocates or directs imminent lawless action and is likely to incite or produce such action. Under Brandenburg, courts must consider the intention of the speaker or writer, as well as her ability to persuade and arouse others when evaluating the danger presented by particular speech. Courts must also consider the susceptibility of an audience to a particular form of expression, including the likelihood that certain members of the audience will be aroused to illegal action. Despite the reformulation of the clear-and-present-danger test, Schenck retains constitutional vitality in cases concerning the Freedom of Speech Clause, having been cited in more than one hundred state and federal judicial opinions in the 1980s and 1990s. Alonso, Karen. 1999. Schenck v. United States: Restrictions on Free Speech. Springfield, N.J.: Enslow Publishers. Dow, David R., and R. Scott Shieldes. 1998. "Rethinking the Clear and Present Danger Test." Indiana Law Journal 73 (fall). Rabban, David. 1983. "The Emergence of Modern First Amendment Doctrine." University of Chicago Law Review 50 (fall). Communism; Dennis v. United States; Smith Act.